One of my favorite movies as a kid was "20,000 Leagues under the Sea". As an adult, "The Abyss", especially the Director's cut, became one of my favorites. Both are about living underwater. While I'm not sure I would ever want to live underwater, I thoroughly enjoy snorkeling and have for many years. One of my other passions is photography. Until now, I haven't been able to combine the two. But after our last sailing trip I decided to buy an underwater housing for my camera. (Stan has one for his camera and I enjoyed playing with it last time.) 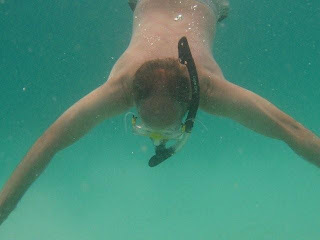 Getting the underwater housing for my camera to Vava'u was not easy or quick. I ordered it online and had it shipped to my parents. They re-shipped it to me and last week it arrived. That seemed as good a reason as any to go sailing this past weekend. I joined nine of my fellow volunteers onboard the Orion, a catamaran. We sailed off into the Pacific past islands in a section of the Vava'u island group where I had not been before. Once we anchored, I spent a good amount of time just playing with the camera. Most of the first pictures I took were over-exposed. I also had to deal with some condensation build-up inside the housing. I didn't get any pictures that I really liked at the first stop. From there, we sailed another 45 minutes or so to an area with lots of coral and fish. It was a much better place to snorkel than our first stop. The fish here were really spectacular and while you can get an idea from the photo, I think the video shows it much better. James took a couple of photos using my camera as well, including this one of my diving down from the surface. 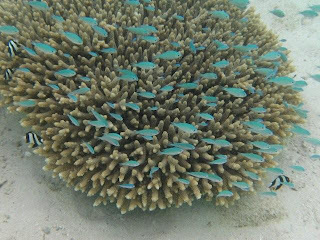 It is really different taking photos underwater. It is much more difficult to compose the shots and for the video, it's hard to hold the camera steady in the ocean currents. I'm sure I will improve with time. Unfortunately, it may be tougher for us to go sailing for the next several months. During the off-season, we can negotiate really good deals because the boats are sitting there not being used. But as more tourists start arriving, the boats are more in demand and the prices increase beyond what we can afford as Peace Corps volunteers. Already, you can tell there are a lot more people here when you walk through town and most of the businesses that have been closed during the off season are either open now, or will be open by the end of the month. Saturday, Vava'u ran out of milk. The only milk that is ever sold here is the boxed kind that can be stored without refrigeration. Occasionally I've been able to buy boxed skim milk, but this is the first time that there has been no milk of any kind anywhere since I've been here. I went to four stores Saturday in search of milk and all were sold out. Because there are no boats until next Wednesday, that means no milk for five days. It's part of living on a remote island. Several weeks ago, the island ran out of gas for several days. While I'm very happy living in Vava'u, I do miss the selection and the prices we had when I lived in Nuku'alofa. Every single item I buy here except for fresh eggs is more expensive than the same items in Nuku'alofa. And we do not have anywhere near the selection in the stores or the market that you can get in the Capital city. I'm going back for a Peace Corps meeting at the end of the month and I'm looking forward to stocking up on the stuff we can't get here and saving money on the other stuff. It's funny how your perspective changes. When I was in Nuku'alofa, I missed the selection we had in the United States. We said good-bye to Scott this week. Scott is a former Peace Corps volunteer who completed his two years of service earlier this year. He was the last of his group to leave but Scott stuck around because he's engaged to a Tongan woman and he had to fight through the bureaucracy to get her a visit so they could return to the United States and get married. For Scott and his fiancé, they spent $1000 dollars to fly round-trip to Fiji so they would apply for a Visa. It was granted; they came home and left Vava'u on Saturday. This is a group picture from inside my house on Thursday night. Scott is the guy sitting behind my right shoulder. This was the second tour of duty in the Peace Corps that Scott has completed. He previously served as a volunteer in Mongolia. I've uploaded 13 new photos from our sailing trip to the online photo album. Four are from above water and the other nine from below the water. Let me know what you think. Hello! I am a blog reader from the Philippines. You have a beautiful site. It is worth visiting. Thank you so much for the kind words and am glad you enjoy the site.